As a teenager in the 1990s, hoop earrings were a staple accessory in my fashion repertoire. Specifically, big, gold hoops—the bigger the better. These days, the hoop is still a vital component in my jewelry box, but as my style and taste have evolved, so have the hoop earring options available. 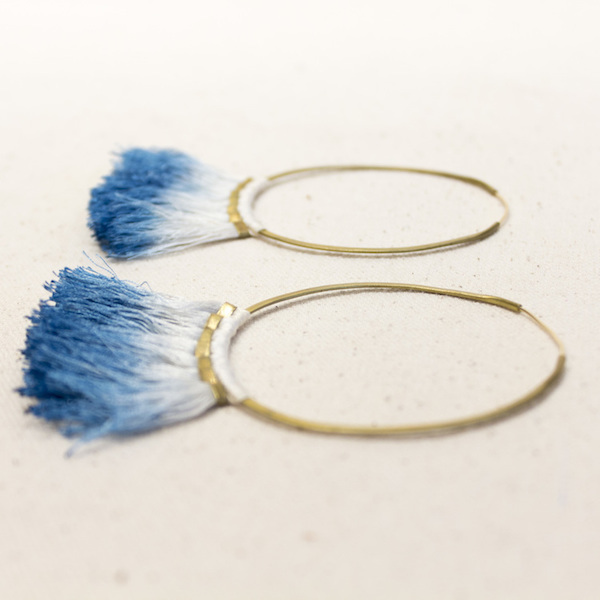 Modern hoops come in various shapes and sizes, myriad materials ranging from gold, rose gold and brass, and may be embellished with beads, tassels and enamel painted details. With so many options, all of my inner teen’s hoop dreams are coming true. Here are some of my current favorites: these hand-crafted Indigo Ornament Hoops from Jen Goff of Takara offer beautiful flare with blue ombre fringe and can be found at Cameron Marks in Santa Cruz. The Alameda Hoop Earrings from Betsy and Iya, are a dramatic take on the classic hoop with their oblong shape and horizontal bar detail. These geometric “Staircase” hoops from Serpentine and Fair are a unique design that goes with anything and can be found at Santa Cruz boutique Stripe.